Parents often ask me for advice on buying an instrument, so I have prepared the following as suggestions to consider. One can ask ten different teachers about buying an instrument, and as many as ten different sets of opinions will be proffered. These recommendations simply reflect my own personal preferences on the matter. Purchasing, as opposed to renting, a violin should be a decision made after careful consideration. For most students, the first violin remains their primary instrument for a number of years, and so it is important to purchase one of good quality that will provide years of enjoyable playing. I generally recommend renting an instrument until the child is ready for a full-size (4/4) violin. As children grow, they may go through two or three differently sized instruments before being ready for a 4/4 violin, and purchasing these smaller sizes can become unnecessarily expensive. The three important factors to consider in a student instrument are durability, sound quality, and price. Unfortunately, to have one factor may mean giving up another. Many student violins are made to endure the physical abuse common to most children’s instruments as they are carried about from home to school and sometimes knocked around a bit by careless colleagues. Some are made of thicker wood and have heavy coatings to protect against such abuse. But while these characteristics make the instrument less prone to nicks and scratches, they render the instrument lackluster in sound quality. Conversely, instruments constructed to offer the best sound are more susceptible to minor scarring. It is my opinion that the sound quality of an instrument should be given greater weight. A good student can be taught to care for the instrument properly and can avoid most minor nicks and bumps. But even when these occur (and they usually do when the instrument is used in school), it is far better to practice and play on an instrument that sounds lovely even with its minor blemishes than to have a pristine instrument with no sound at all. As for price, the old adage “you get what you pay for” is a good rule of thumb — but not always. Simply because one instrument is more expensive than another does not necessarily mean it is a better instrument. I have seen instruments priced upwards of $2000 that are of far poorer quality than some that sell for less than half that amount. On the other hand, when you see an instrument being offered for practically nothing, you can be reasonably certain that’s exactly what you’ll get — nothing. When looking to buy a good student instrument, you should expect to spend a minimum of $700-$1500, unless you simply come across an exceptional bargain. Anything less will almost always result in an instrument that is good for little more than wall decoration. The violin. Every violin, like every person, has its own distinct characteristics. This is true even of factory-made violins. Two violins of the same model by the same manufacturer will have subtle differences in sound and response. Nevertheless, there are broader differences that make some instrument models preferable to others. You must first decide whether you are planning to buy a new or used instrument. My advice is that unless you know what to look for, you will be better served buying a new instrument. If considering a used instrument, I strongly recommend that you buy only from a reputable violin shop rather than from an individual, a “general” music store, or a pawn shop. It is, of course, possible to find an excellent instrument from these other sources, but the chances of doing so often are not very good. My personal recommendation for an excellent first violin is the Mathais Thoma model MT-100. This Romanian-made violin generally sells for $700-$800 and is a very nice instrument for beginning to intermediate students. Especially when fitted with a set of Corelli Crystal strings, the instrument produces a lovely, warm tone with good response. I have seen many instruments that cost far more that are of far poorer quality. The MT-100 is available at most good music stores (though some will put their private label in them), or it could be ordered from Tom Kerr, owner of Fantastic Instruments in California. I have dealt with Mr. Kerr on a number of occasions and can recommend him highly. There are other instruments that also can serve as good student violins, but there are some that I definitely recommend against. As a rule, I suggest staying away from the low-end Chinese instruments. The Chinese violin makers have improved greatly in the last few years with their high-end instruments, but those designed for students still tend to be below standard. Most Knilling and Suzuki instruments I have seen, while very durable, lack adequate tone and color to serve as a long-time instrument. The bow. The standard violin bow is made of wood. A good wooden bow is the most responsive and balanced, but it is also the most easily damaged. Students — especially young students — are well advised to consider some of the modern bows made of more durable material. 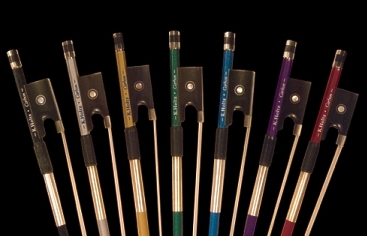 Fiberglass bows are very common in school orchestras. They are inexpensive, but they also tend to be somewhat heavier and poorly balanced. I recommend that students consider a carbon composite bow such as the Samuel Eastman K. Holtz which can be purchased for $80-$100. Carbon composite bows are well balanced and extremely durable. For those with a flair for the unusual, they also can be obtained in a number of different colors. Strings. Like violins, strings also have a character all their own. The same set of strings will often sound markedly different on different instruments. I have found the MT-100 to respond best with a set of Corelli Crystals. These strings are inexpensive but produce a warm, gut-like sound. Thomastik Dominants are also very good strings, though more expensive, and produce a brighter tone more suitable for solo playing. Other good strings are the Pirastro Obligato, Violino, or Synoxa; the D’Addario Zyex; and the Tomastik Infelds. Students should avoid gut strings as they are very temperamental and suitable more for professionals. I recommend avoiding some of the commonly sold strings such as the Super-Sensitive Red Labels and Mathais Thomas. (Mathais Thoma produces an excellent violin, but they make horrible strings.) Over time, you may want to try different sets of strings on your instrument to determine which offers the best sound and response. Strings should be replaced at least once a year, and it is preferable to replace them every four to six months. Other accessories. The shoulder rest is an important accessory for most students as it helps in holding the violin in place and reduces muscle strain in the neck and shoulder. A wide variety of shoulder rests is available, and you may want to try out several different styles to see which has the best feel for you. Some that I recommend are the Canadian-made Kadenza which, unfortunately, is hard to find in the U.S. It is a Kun-style rest with all-rubber feet that will reduce the risk of scratching the instrument when it is being put on and removed. The Kun and the Wolf are also very nice rests. Nearly all new violins will come with a chinrest, the Guarneri style being the most common. Like the shoulder rest, the best chinrest is what feels best to the individual player. I personally do not like the Guarneri style, though it seems the chinrest of choice for most students today. Others you may wish to consider are the Dresden and the Flesch styles. Initially, however, I recommend using the chinrest that comes with your instrument unless you find it uncomfortable. Opinions about rosin vary greatly, but in my opinion most rosins work fine for student violinists. Avoid the extremely cheap rosins, but otherwise use whatever you find best. Among the brands I can recommend are Hill, Pirastro, and Millant-Deroux. Often you can find these on eBay for greatly reduced prices, but none are particularly expensive. A cake of rosin will last indefinitely, and you will undoubtedly break it or lose it before using it up completely. Another item I strongly encourage my students to buy is called a Dampit. These are inexpensive little devices that help keep an instrument humidified during our dry winter months and will reduce the chance of cracked wood. Many students, especially those of smaller stature, may prefer a flat-back mandolin, and these are available primarily in A and F models. While these styles are preferred by those who play folk and bluegrass music, some of them have a lovely tone that can rival the traditional classical shape. A sample of the different mandolin styles is shown below. Strings. For most mandolins, I recommend Lenzner Consort or Thomastik Infeld strings. The Hannabach E string is also an excellent addition to a set of Lenzner or Thomastik A, D, and G strings, but the Hannabach is sometimes difficult to find in the U.S. Flat-wound strings are recommended over round for beginners as they are gentler on the fingers. The plectrum. More commonly known as the pick, the plectrum is an item that must be chosen carefully. As they are inexpensive, I encourage students to try different kinds to find what works best for them. The original mandolin plectrum was made of quill, cheery tree bark, or, later, tortoise shell, but it is rare to find a mandolinist using these today. Be sure you buy a plectrum designed for the mandolin as they differ somewhat from standard guitar picks. As a rule, mandolin plectra should be more than 1 mm thick, which is about twice the thickness of most guitar picks. Among those I recommend are the German-made Wolle plectrum or the Wegen M150. When possible, I suggest students try a Ranieri-style plectrum as they offer the best dynamic control. The footrest. A footrest of some type is a great aid while playing. Any type of material that allows the mandolinist to prop his foot at the proper height will suffice, but a standard footrest such as that used by classical guitarists is recommended. The lap cloth. A lap cloth is highly recommended for the classical (bowlback) mandolin. This is simply a piece of soft leather large enough to cover the player’s lap where the bowl of the mandolin rests and provides stability by keeping the instrument from slipping while playing. Any type of non-slip cloth or leather that offers support will suffice (I use a deerskin) and can be purchased at a leather goods or fabric store. Many players of flatback mandolins also find a lap cloth useful. The shoulder strap. A shoulder strap is not necessary for the classical mandolin. It is used only when playing while standing and, as with classical guitar, the traditional playing posture is with the mandolinist seated. Of the instruments I teach, the recorder is by far the least expensive, at least for student models. Beginner molded-plastic soprano recorders are easily found for under $10, and these are the instruments generally used in the local schools. For the more serious student, however, I strongly recommend buying a good wooden recorder as they typically provide much better intonation and tone quality. Low-end student instruments, but still adequate for a young beginner, can be had for as little as $30-$50; better instruments usually cost between $100-$300. Though concert-quality recorders can run well over $1,000, very good quality student instruments can be obtained for far less. Altos, tenors, and basses are more expensive, but I always recommend that students begin lessons on soprano recorders or sometimes an alto. Once learning a soprano or alto, it is relatively easy to transition to a tenor or bass. There are many fine recorder makers in the world today, and the choices at times seem almost limitless. Among the makes I recommend for students are Mollenhauer, Aulos, Kung, and Moeck. Accessories. Recorder players require fewer accessories than violinists or mandolinists. Essential, however, are a mop or cleaning rod, cork grease, and a protective case for storage and transport of the instrument. Some people like to keep their recorder on a recorder stand at home, and a few students may find a clip-on thumb rest helpful in the beginning. Beyond these items and a music stand, little else is required.